Ah, the day that we gather around all the chips, dips and cream cheese this world has to offer! 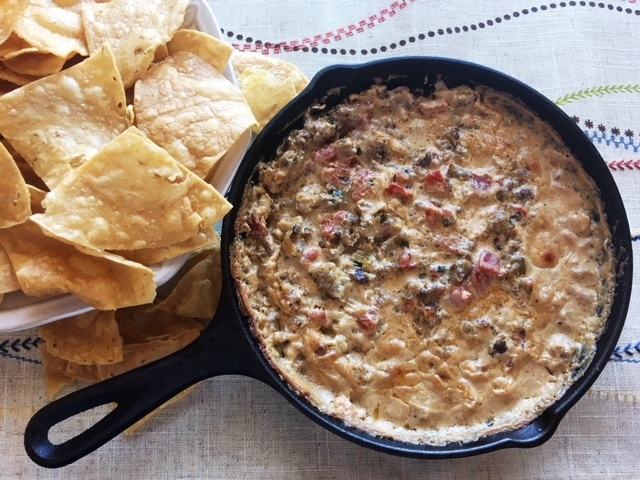 Karen’s warm and hearty Wicked Superbowl Dip is the perfect dish to prepare for your shindig. It is easy to double or triple and can be made in the microwave, crockpot, stove or oven. (pictured baked, in an iron skillet). There really isn’t a way to mess this up! 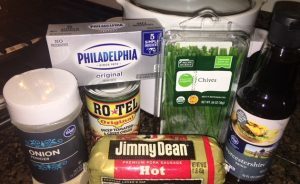 Add these ingredients to your grocery list this week, because this Wicked Superbowl Dip will be a hit! Also, check out Karen’s method for browning ground beef in the oven without the splatter (it works the same for browning sausage). Watching carbs and can’t eat the chips? Don’t deprive yourself! 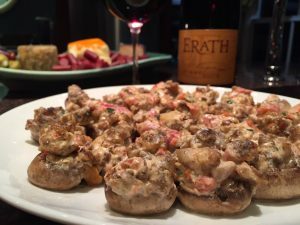 Stuff your dip into mushrooms and bake. It’s a little trouble but oh so worth it! I’ve told you how in the directions below. In a large skillet over medium-high heat, cook sausage until crumbled and no longer pink. Drain. Add chives, worcestershire sauce, onion powder and garlic powder. Stir thoroughly. At this point, you can transfer it to your slow cooker to keep it warmer, longer. Or place in oven-safe dish and bake at 375 degrees. Stir occasionally until cream cheese is completely melted. Cook until warm and bubbly around edges. Clean mushrooms and remove stems. Add chopped stems to sausage when browning. Assemble dip. 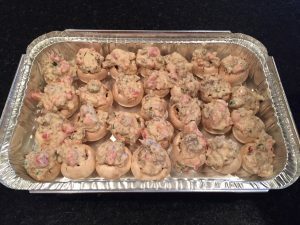 Arrange mushrooms in a shallow baking dish and using a small spoon or cookie scooper (my preference), scoop a dollop of dip onto each mushroom. These are some trouble so I suggest doing them ahead and refrigerating until ready to bake. To bake, place on upper rack in a preheated 350 degree oven. Bake for 20 minutes until mushrooms are hot and sizzling.